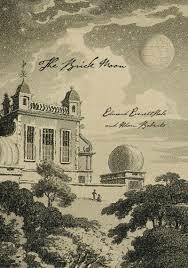 The Brick Moon was first published in two parts in Atlantic Monthly, to which Hale was a Contributing Editor. The first part, ‘The Brick Moon’, appeared over three issues in October-December 1869; the shorter sequel, ‘Life on the Brick Moon’, was published in February 1870. The two parts, brought together as one book in 1871, would appear to be the first story of an artificial satellite in science fiction. It is republished here, along with a new sequel (of sorts) by Adam Roberts, to coincide with the exhibition ‘Stars to Satellites’ at the Royal Observatory, Greenwich, and as such comes garnished with an Introduction jointly written by Marek Kukula, Public Astronomer, and Richard Dunn, Head of Science and Technology and the Royal Museums Greenwich. Such are the basic facts about this book. But none of that tells you just how peculiar the whole thing is. It is described as a ‘lost classic of Victorian science fiction’; well, it occupies an interesting place in the history of the genre, and it is typical of Victorian science fiction, but it is not a classic. Rather, it is an engaging oddity, the sort of short novel one reads with a certain pleasure while all the time wondering whether, even in the middle of the nineteenth century, it made any sense whatsoever. The Longitude Prize was offered by the British Government in 1714 to whomever would find the most accurate way of determining longitude while at sea. Although sun, moon and stars provided a fairly straightforward way of determining latitude, longitude was not so simple and lack of this knowledge was leading to a high volume of lost shipping. The prize was eventually awarded in 1765 to John Harrison for his chronometer, and though the Board of Longitude made a number of subsequent payments, mostly for refinements to the chronometer, the quest for longitude had effectively been settled. And yet, when Hale’s novella opens, 80 or so years later, we are introduced to a group of American students earnestly discussing the Longitude Prize, and calculating how they might win it. Nothing happens for the next little while as the students go out into the world and, being American, inevitably make their fortunes. Then they get together and revive the plan. An inordinate and fairly dull portion of the story is now given over to raising funding for the project, which is finally secured as a result of judicious investment in government bonds during the Civil War (or war profiteering, as we might think of it). Then, by chance, our narrator finds the ideal location to build their flywheel, with which they plan to launch the satellite in preference to the gun that both Verne and Wells would later choose. Must be some flywheel, but although considerable attention is paid to the construction of the brick moon, we get very little information on the means of propulsion. But then, as the project nears its conclusion, with some of those involved making a temporary home inside the hollowed-out moon because it is so well constructed, a massive storm breaks out. The moon is swept from its moorings, the flywheel it released, and the moon is flung into space. Which is where the first part of the story ends. Hale’s original sequel picks up a couple of years later, when our narrator finally locates the brick moon in its polar orbit. Watching it through a telescope, he sees small figures leaping up and down on the surface of the satellite. He realises that the people who had been living within the moon had survived their journey into space, and that their rhythmic jumps are a form of code. A means of communication is established, though it allows for messages no longer than an average tweet. Painfully slowly, we get some glimpses of life on the brick moon. They have atmosphere, which seems to be deep enough for them to survive the very high jumps that low gravity allows, and for some reason the low gravity is resulting in plants evolving at great speed so they have plenty of food. And at that point the two sides run out of things to say to each other. Life on the brick moon is only ever seen from outside; it seems that they have established some sort of utopian society (Hale’s narrator, variously Captain or Reverend Frederic Ingham, also featured in other utopian fictions by Hale), but we learn nothing of the nature of the utopia. In this curious silence, the narrative simply ends. But Adam Roberts’s modern sequel, inevitably called ‘Another Brick in the Moon’, does nothing to develop or amplify any of the issues that Hale raised but took no further. Instead, Roberts has his own narrator happen upon a transcript that reveals unexpected truths behind Hale’s fiction. Unfortunately, when he publishes the transcript, he becomes the object of shadowy government agencies, and the story turns into a conspiracy thriller with an extended chase sequence. It’s all good fun, but it sits oddly with Hale’s rather plodding original. But then, oddity seems to be the watchword for this entire enterprise. ‘The Brick Moon’ is an engaging curiosity that stops just at the point when it might have become interesting. But as an example of the Victorian habit of holding science fictional novelties at a distance, it is worth your attention.